This is a typical olive-grove Provencal property, so the property is on terraces with olive trees. The road that goes past our driveway is a dead-end lane leading to the fields and woods, so the very little traffic consists only of local residents. At the top of the our road is the village bakery, where village information is exchanged and much gossip takes place. There are weekly village markets. Various supermarkets are to be found nearby. Claviers is an old medieval hill-top village with typical, narrow, windy, streets and alleyways, adorned by pots of geraniums, French cookery smells and, again typically, washing that dries in the hot weather! Visit local vineyards, street markets, museums, forest walks, Verdon rafting, St. Cassien windsurfing. Or watch Southwest panoramic views over village. Or walk in five minutes to village centre with restaurant, post office, bar, church, bakery, shop. 1+ hour drive from Nice airport past lake and supermarkets. Many of our guests, who appreciate calm and rural peace and seclusion and local Provencal small-village charm, return year after year to our house. In the village centre are also a restaurant/bar on the village square by the church, another typical bar/café, a "terrain de boules" that is much used by locals, and a village shop. Rentals run from Saturday 16:00 to Saturday 10.00; we do only weekly rentals. We are a professional and academic couple. The house has some interesting posters from local exhibitions of artists associated with the area (several Surrealists lived in Seillans), a collection of books left by visitors over the last dozen years (good novels and 'trash' novels!)... Several visitors have remarked that the house is more like a family home than a rental cottage. Indeed, it is our holiday house! toilet, WC on its own. toilet, bidet, WC, bidet, handwash basin, mirrored bathroom cupboard. Bathroom with bath/shower, bidet, hand-wash basin and washing machine. One separate WC near bedrooms. A second separate WC with hand-wash basin at the other end of the house, off the kitchen/dining room, close to the swimming pool. Espresso machine with milk frother. And coffee paper-filter machine. Lots of cutlery, crockery and kitchen utensils. New kitchen with oven, microwave, large fridge, large freezer, hobs, toaster, kettle, etc. Dining table and chairs. High-chair for small children. And sofa for chatting to the chef... The kitchen gives unto the outdoors dining area. There is also a sofa in the dining area. And a chopping-trolley. A few toys. Balls. Rackets. Etc. Because the house is on the ground-floor, disabled visitors find it an easy house to deal with, even though there are two steps between the sitting room and the kitchen-dining room. Cars can be driven up to the house itself, so, again, access is easy. There is a gentle slope between villa and pool. There are steps into the pool (not a ladder). Some visitors love toddling up to the village and chatting to the locals in the village café! One of the really pleasant aspects of our house is that all the rooms face the panorama over the valley with its forests and towards the hill-top village of Claviers, facing the afternoon and evening sun with wonderful sunsets... A couple of steps, running along the front of the villa with its French doors are used by many people for evening drinks in the late afternoon and evening sun. A very curious thing is that sometimes, in the early evening, one of our local friendly 'sangliers' (wild boars), known as Francine, ambles down the hillside from the woods, past the property and into the village for its evening meal. Some guest have even been able to photograph Francine as she lazily ambles past... And when people sometimes hear gentle snorts in the middle of the night, it's Francine digging up some of our wild orchids as a midnight snack, on her way back from Claviers and on her way home up the hill... The private pool (approx. 14 m x 5 m) has a shallow end and a deeper end, and it is definitely not a diving pool as the maximum depth is about 2 m. From the pool there is a lovely panorama towards the village of Claviers. Outdoors dining table and chairs. Sun beds. Built-in BBQ. Terraces with olive trees. Ping-Pong table. Utility Room: Outside built-in BBQ. Outdoors large dining table and chairs. Sun beds. Ping-Pong table with racquets and Ping-Pong balls. Ironing board and iron. Cleaning / Towels / Linen / Maid service: In addition to our basic rental, there is a standing cleaning charge (110 Euro per rental) and a standing linen charge (bed linen, towels; 15 Euro per person), which are paid directly to the property manager, Biddy, who receives guests to give them keys. What a gem! We stayed here (two adults, two older teenagers) for two weeks end of August/beginning of September. We had a very comfortable stay, the house being just as described. Everything worked, the kitchen was well equipped, there was a constant supply of hot water - all those little things you take for granted that can take the shine off a holiday if they're missing, were all there. Add to that a medieval village within very easy walking distance which has a shop, a couple of restaurants and bars, a bakery; other similar villages within easy driving distance; fantastic countryside for walking and exploring; the list goes on. It really is a perfect spot. Highly recommended. The nearest sea-side beaches are at Frejus St. Raphael, which has one long beach, and at St. Aygulf, which has many small sea-side coves. There are also water sports at the Lac de Saint-Cassien. Use of car is essential to get to Claviers, though shopping can be done by foot to the village shop and bakery and the weekly markets. The nearest airport is Nice. If travelling down the motorway (AutoRoute du Soleil) from Calais, the AutoRoute exit is at Le Muy. The nearest bank is in the next hill-top village at the other end of our valley, Bargemon. Both Claviers and Bargemon have post offices. Bargemon is bigger with lots of restaurants and a small supermarket and several shops. Each village has its own doctor. There is a chemist shop in Bargemon too. There is a vet in Callas, which is another neighbouring hill-top village. Vineyards are close by for visiting, tasting and buying. Claviers itself, within a very short walking distance along our dead-end road, is a small and very friendly village with its small village square with its church, restaurants and cafés, shops, pizzeria, bakery, small playground, were people greet each other in the street and stop for chats. A meeting place for locals is of course the "terrain de boules" in the centre of the village. Claviers is surrounded by forests with many walks. At the same time, Claviers is also surrounded by other hilltop village such as Fayence, Seillans, Bargemon. But despite these very many activities and sights (also, by the way, are the many concerts that are held in local churches during the summer season), visitors to our house seem to particularly enjoy the restful, peaceful and rural nature of our house with its views across the valley and over Claviers and Bargemon, with our really nice pool. Every hour you will hear the distant church bells from Claviers, and, if the wind is in the right direction, Bargemon. The village is a few minutes walk away along a quiet country dead-end road (it ends at the entrance to the forest) with the occasional car. 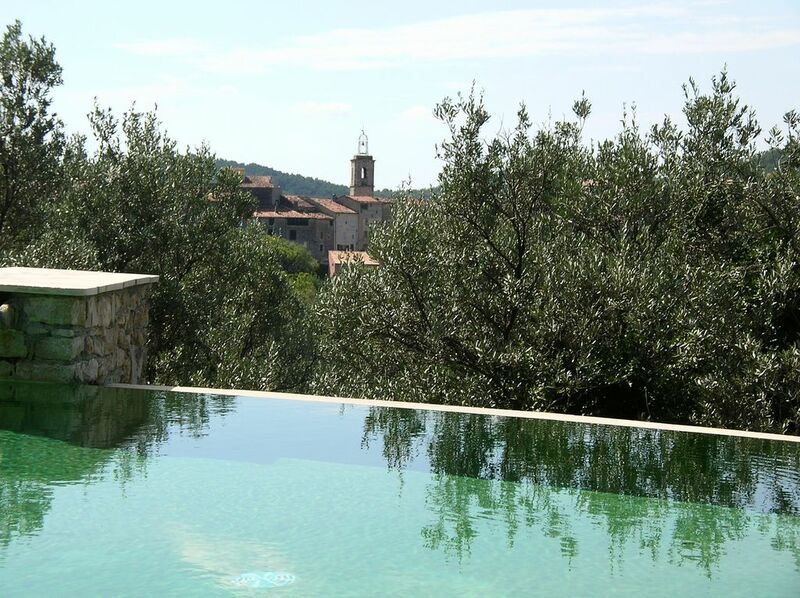 Our house is on our one-acre terraced olive grove, so it has a real Provencal quality to it. Our house has old family knickknacks and children's games, so we do appreciate people treating it with respect. Also our Danish house-keeper, Biddy, who lives locally, is a (typically Scandinavian) house-proud person who takes pride in the cleanliness and tidiness and presentation of our house, so it is much appreciated if visitors leave our house not too messy. Our kitchen, by the way, is well equipped. Booking Notes: RENTAL After the 30% deposit, the remaining fee is paid one month before the start of the rental. At all stages, we send standard letters of acknowledgement. We can be contacted by email and phone for questions or problems at any time. (We live in London.) CLEANING CHARGE AND LINEN There is also a standing cleaning (110 Euro per rental) and linen charge (bed linen, towels; 15 Euro per person), paid directly to our property manager, Biddy, who receives guests and gives them the keys before leaving them in peace. Changeover Day: Changeover day is always on Saturdays, with people leaving in the morning and people arriving in the afternoon. (Cleaning, washing and ironing, pool cleaning, etc., takes place between.) Visitors communicate with Biddy by phone or text to confirm their arrival time. If they are going to be very late, Biddy leaves the keys for them. If visitors come before cleaning is finished at 4 pm, they can always 'chill out' by the pool while Biddy and her team finish the house cleaning.